Disney star Jasmine Richards was bullied her entire life and high school was the worst four years of her life, she told a crowd of about 100 Toronto junior high and high school students. The 22-year-old actress, known for her role in the Camp Rock films, was busy working throughout high school and it was hard for her to make friends. Because she was an actress, the other students assumed she thought she was better than them, she says. 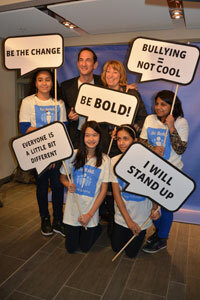 Richards was one of the speakers, along with Toronto Raptors centre Jamaal Magloire and Ontario’s Minister of Education, Laurel Broten, at the launch of Facebook Canada’s Be Bold: Stop Bullying campaign on November 14. The campaign asks teens, parents and teachers to sign a social media pledge on Facebook committing them to stop bullying if they see it happen. It’s aimed toward bystanders to speak up and help put a stop to bullying. 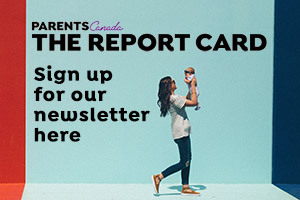 “Bullying is not just kids being kids, it has a damaging impact on young people on families and on communities,” says Jordan Banks, Managing Director at Facebook Canada. “Each and every person … has the power and ability to help stop bullying. Bullying is just as hurtful, whether it occurs in cyberspace or in person, says Debra Pepler, co-scientific director of PREVnet, a national organization that researches bullying prevention. When researchers observed bullying on a school playground, they found that 75 percent of the bystanders gave positive attention to the bully, which made the bullying last longer, she says. Meanwhile, when a bystander steps in, it makes a huge difference. It stops bullying within 10 seconds more than 50 percent of the time, she adds, so a bystanders’ role is important. Help put a stop to bullying and sign and share the social media pledge here! For anyone experiencing bullying, Richards’ advice is to stay true to yourself. “Tell an adult, tell a parent, tell a teacher, anything. Talk about your issues and you know what, it does get better,” she says. The campaign is partnered with Family Channel, PREVNet, Concerned Children’s Advertisers, Kids Help Phone, MediaSmarts, Free The Children and STOPcyberbullying.org. A similar campaign was launched in the United States in September 2011, which saw more than a million people like the page. Do you know the signs of bullying?